How to use the rebar calculator? 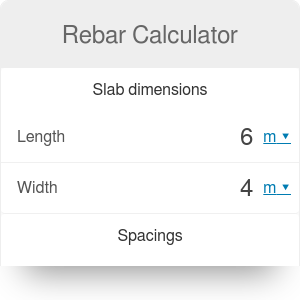 Rebar calculator helps to find out how many rebars you need to create a reinforcement in a concrete slab and how much it will cost you. Moreover, it can estimate the dimensions of the grid that should be used. In the article below, you will find what is rebar, check the rebar sizes and find the step-by-step tutorial on how to use the rebar calculator. Rebar (reinforcement steel/reinforcing steel) is a building material used to improve properties of concrete blocks. Those wires are made of patterned steel (improves adhesion), and they are usually placed in a way to create a mesh. Thanks to the steel characteristics (thermal expansion coefficient very similar to the concrete's), reinforcement compensates for low tensional strength of concrete. Rebar may boost the resistance to failure of concrete even several times. Civil engineers apply the reinforcing steel while designing buildings and poured concrete driveways. Besides the increased tension resistance, rebar also improves concrete cracking resilience and allows for reducing the thickness of concrete blocks. Applying the reinforcement is for sure a more expensive building solution. However, contractors tend to use it in practically all construction projects - it's uncommon to use non-reinforced concrete. After a few years, you will notice that placing rebar was, in fact, a money-saving decision. Why? Because reinforced concrete slabs, blocks, driveways and buildings will last much, much longer. For the imperial-unit countries, bar sizes give the diameter in units of the ⅛ inch for bar sizes #2 through #8. For example, 8⁄8 = #8 = 1 inch diameter. Equivalent metric size is typically specified as the nominal diameter rounded to the nearest millimeter. These sizes are not considered as standard metric sizes - they are considered soft conversion or the soft metric size. Imperial sizes system recognizes true metric bar sizes (No. 10, 12, 16, 20, 25, 28, 32, 36, 40, 50 and 60). That indicates the nominal bar diameter in millimeters. Rebar grid dimensions (length & width). They are calculated by subtracting the edge-rebar (grid) spacing from the sizes of the slab. Total length of needed rebars. To calculate this, we need to know how many vertical and horizontal lines of rebars will be placed. E.g., the number of rows is calculated by dividing the grid length by the rebar-rebar spacing. To obtain the legth of rebars, multiply this number by grid width. Number of rebar pieces. To estimate this, divide total rebars length by the length of single rebar. This value should be rounded up to the nearest whole number (because we cannot buy, e.g., 0.4 rebar piece - only standard lengths). Total cost of rebars. Multiply the number of rebar pieces by the price of a single rebar piece. First, enter the concrete slab sizes: length = 6m, width = 4m. Specify the spacings: rebar-rebar spacing = 40cm, edge-grid spacing = 8cm. Fill in the price and single rebar length that you will buy at your supplier: rebar price = €2/m, single rebar length = 6m. Finally, take a look at the calculation results: grid length = 5.84m, grid width = 3.84m, total rebars length = 112.13m, rebar pieces = 19, rebars cost = €228. Rebar Calculator can be embedded on your website to enrich the content you wrote and make it easier for your visitors to understand your message.